Shipyard is BWG’s first (and only, so far) game project. It first saw the light of day in August 2013, when I released an early version of the ship editor as a “tech demo.” Since then, I have been developing and expanding it. Though it is still far from complete, it has come a long way since that initial version. Shipyard is a turn-based strategy game in a science fiction universe. 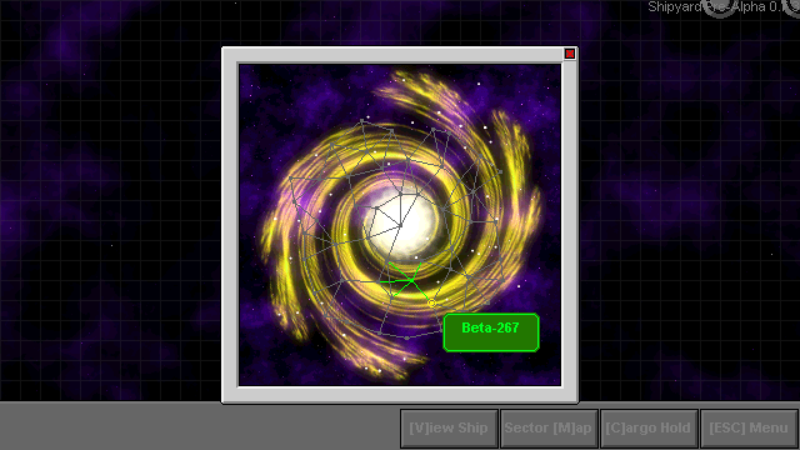 The core mechanic is the ability to build your spaceship from individual systems. Combat revolves around strategically destroying enemy systems to hamper its ability to fight back while you wear down its structural integrity. The world is randomly generated and, though it is thinly populated at the moment, I have plans to fill it with NPC ships and stations, asteroids to mine, planets to explore, and all that good stuff. Shipyard Launcher v2.2 (BETA) — Best option for most people. Shipyard Pre-Alpha 0.8.1a (Full Client Archive) — Only choose this if the launcher doesn’t work. Shipyard requires the latest version of Java to run. If you get an error on your first attempt at running the game, try updating your Java before asking for support here. If you downloaded the launcher, simply open it with Java (double-clicking should work unless you’ve changed your settings manually) and click Download Latest. The Launcher will automatically download and extract the game for you. The game files will be placed in a folder called “shipyard” in the same location as the launcher. When that is finished, click Start Game. The launcher checks for updates when you first run it, and will give you the option of downloading the latest version if there is one. Doing so will remove the old game files from your computer, but will leave your saves, screenshots, and blueprints intact. If you downloaded the game archive, extract all of the game files to a location of your choosing, then run the file called shipyard.jar to start the game. Running the game this way will not notify you of new game versions. NOTE: The comments are not for support. Please send any bug reports to support@brasswatchgames.com or use the Contact form above. Any comments asking for support will be deleted. Hey Jonah Its Ezekiel! I Think Charging For Shipyard Is A good Idea! You Deserve The Money For The Work Done! Just Let Me Know How Much it Will Be And ill Buy It and I Am Spreading The Word About Shipyard! See Ya,Ezekiel! I said in my post that Shipyard will always be free. Any other games I release in the future, however, will be for sale. Ok Jonah Thanks for the reply! How the Shipyard game going! Hope to see an update ,or even 1.0 soon! You A great Guy Jonah! Keep In Touch! Your Friend/Supporter Ezekiel!